If you are looking to make the transition from a desk job to one that allows you to work from home, you must first concentrate on creating a cozy and comfortable home office for yourself. Now for the first weeks when you shift from your regular 9 to 5, you will feel incredibly happy working from home as this is your comfort zone, the place where you relax at the end of a long work day. However, with time, if you do not have a designated workspace inside your home, you may see yourself slowly slipping into procrastination as your productivity levels plummet. This isn’t necessarily your fault since all of us tend to associate our homes as a place where we escape from work and thus turning your safe haven into your office can come with a huge mental block in tow. So how do you get ahead of this mental block? Well, we have some secrets that we think should help you bridge the gap between home and office effortlessly thus helping you transition from a desk job to your work from home position! Even though it is necessary to fix a particular place in the house as the designated office space, you can still personalize it to bring in a bit of home comfort and cheer to your work desk! The best way to start this off is with a few photos! A healthy mix of happy memories and loved ones means that you always have positive vibes around your home office. 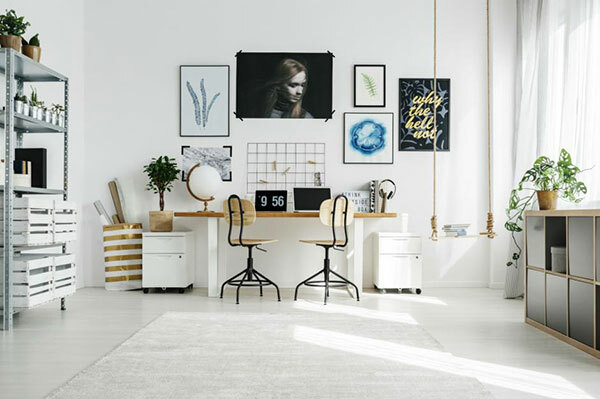 Of course, if you are someone who only keeps digital copies of their photographs around, then you can try out some of the best canvas prints from sites like canvaspop to make sure that you bring in the right dash of color and happiness around your home workspace! Messy workplaces can lead to a drastic loss in productivity as you spend a lot of time searching around instead of being able to concentrate on the job at hand! This is why, it’s vitally important that before you begin the day’s work out, take some time out to clean up and organise your desk. Once that is done, it is always a good idea to plan out your day’s agenda and then break it into easily actionable parts. Once you have the workflow of your day all setup, you can then transfer it into a checklist and keep a track of your progress throughout the day! Not only that, having a checklist means that you can see your work getting smaller right before your eyes and every time you tick something as done, it fills you up with a sense of accomplishment! In a home office, there are often no one around to pat your back or keep your morale up, so little tricks like these can go a long way in boosting your productivity! Your desk and chair are going to be integral parts of your home office and will be without a doubt the one place where you’d be spending most of your time. This is why it is important to make the right choice and get furniture that fits you comfortably even if it might cost a bit more than run of the mill chairs or desks. We always suggest going with an ergonomic chair that provides a good amount of lumbar support along with a standing desk for the healthiest approach to working long hours! At the end of the day, when your home is your workspace, you have to reach a certain balance between comfort and professionalism in order to kick start a successful work from home carrier and with these three secrets by your side, you should be well on your way to creating the perfect home office for you! GaaS Games as a Service the Inevitable Future of Video Games?